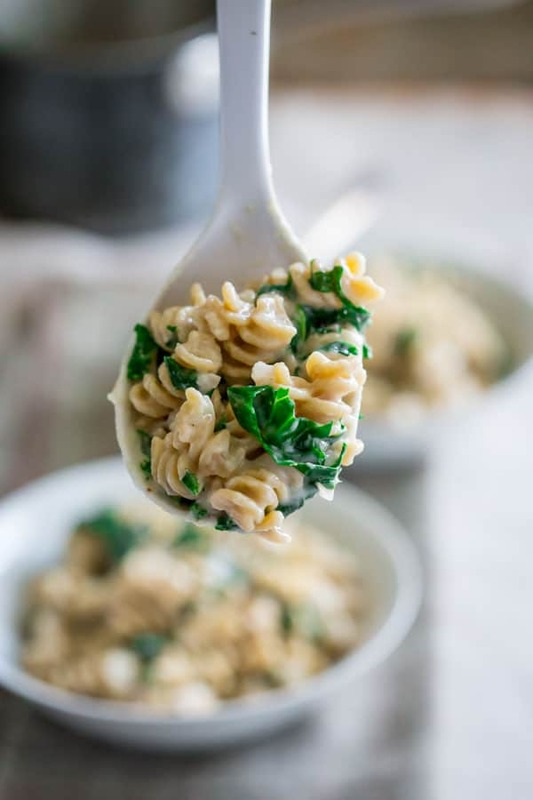 This 20-minute stovetop healthy kale mac and cheese is a healthy whole grain vegetarian dinner that the whole family will devour! I’ll admit, I am always the one to go for maximizing the crispy topping on a baked mac and cheese. When I pull a mac and cheese out of the oven and let it cool on the stovetop, I will pick bits of crunchy noodle and topping off here and there surreptitiously while I put the finishing touches on the salad or whatever we’re having as a side dish. Hopefully nobody will notice! He he. But lately, with the Maple publicity schedule, I haven’t had time to make dinner many nights, much less make recipes for dinner that spend time bubbling in the oven. I am sure we can all relate. Sometimes, stovetop mac and cheese is the way to go. It is just so much faster! I set out to make this healthy mac and cheese on the stovetop and I wanted it to be ready licketeysplit. And I also wanted to make sure it was extra good for you, so I grabbed a few handfuls of kale from the garden to give it some nutritious veggies. 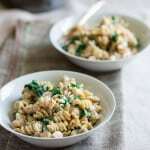 I also used shallot in this recipe, which I don’t normally add to homemade mac and cheese, but I thought it would go well with the kale. It really boosted up the savory sauce and made it so much more flavorful. I didn’t want the sauce to be too watery, so I only used a cup of non-fat milk and thickened it with flour. The flour helps to stabilize the sauce so that the cheese has something to grab onto and becomes creamy as it melts into the sauce. And for the cheese I added in the cheesiest and sharpest cheddar I could find. And guess what? It was so creamy and dreamy and comforting! It made me forget all about my overly busy schedule and my affinity for crunchy topping. 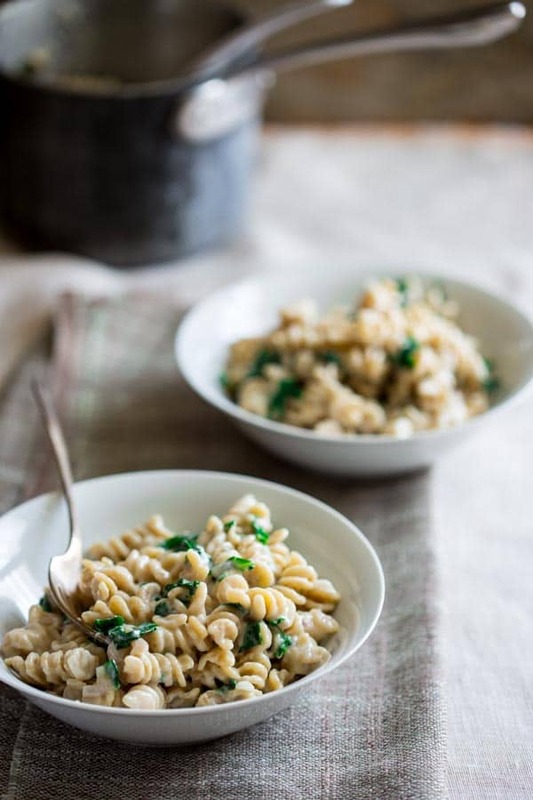 This stovetop mac and cheese is super easy to make, but because the ingredients list is so simple there are a few things you should do to make this dish the best it can be. First, don’t underestimate the importance of salting the pasta water. This adds some much-needed flavor to the macaroni and takes the entire meal to the next level. Second, make sure to let the flour heat up a bit after you add it into the pan with the shallot and butter. You’re not cooking the flour, per se, but stirring it for 30 seconds or so before adding in the milk will prevent the creamy cheese sauce from tasting gluey. 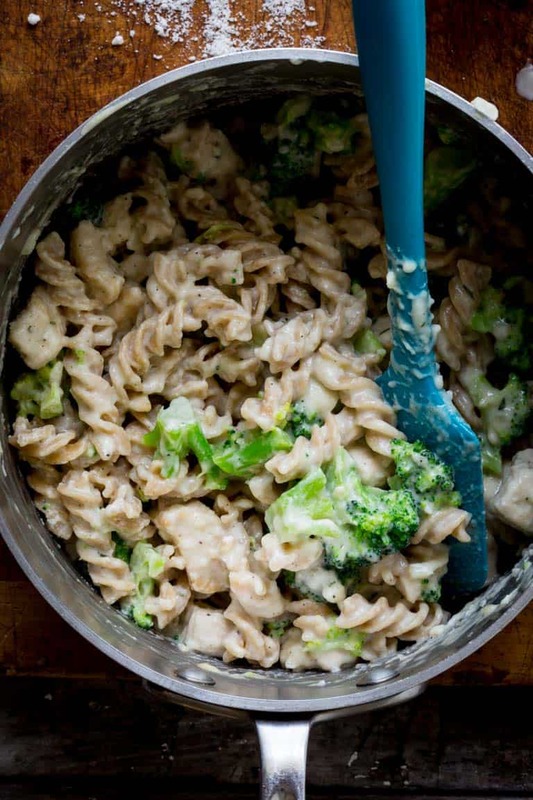 Finally, like I mentioned before I used non-fat milk for this healthy mac and cheese recipe. But if you prefer a creamier mac and cheese or simply don’t have non-fat milk on hand, you can certainly use 2% or whole milk. 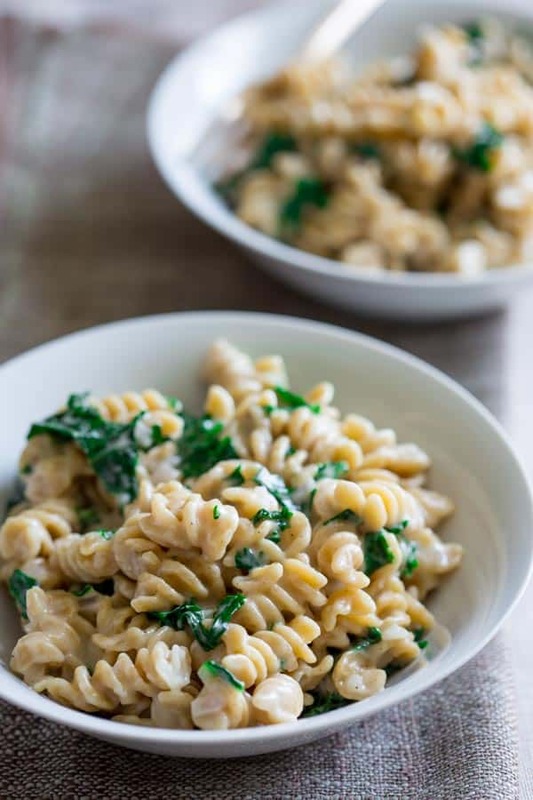 This 20-minute stovetop healthy mac and cheese is a healthy whole grain vegetarian dinner that the whole family will devour! When water boils, prepare pasta according to package instructions adding kale for the last 4 minutes of boiling. Drain well. Meanwhile, melt butter in a medium saucepan over medium heat. Add shallot and cook, stirring until the shallot is slightly softened, 1 to 2 minutes. Sprinkle flour over the shallot and stir to dissolve flour into the butter. Add milk, and whisk until all of the flour is incorporated into the milk. Add ¼ teaspoon salt and pepper. Bring to a simmer, reduce heat to medium-low and cook stirring often until sauce is thick and the shallot is tender, about 3 minutes. Remove the sauce from the heat. Stir in cheddar until smooth. 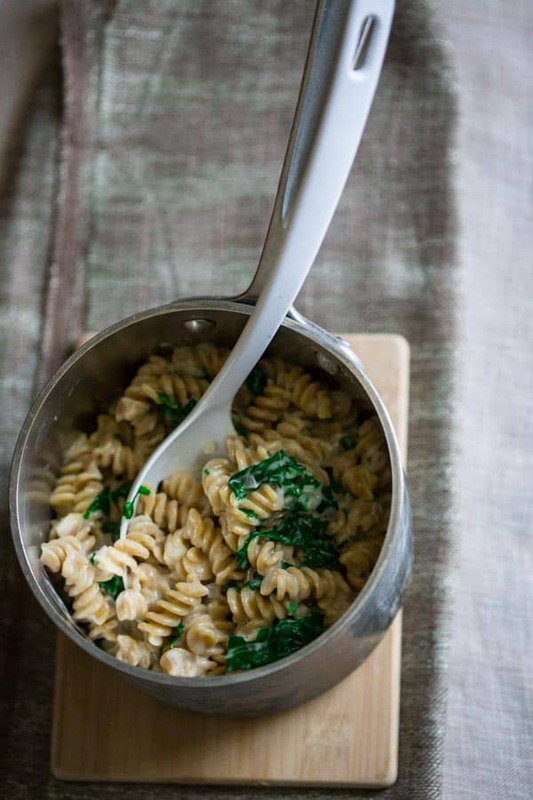 Stir pasta and kale with the sauce in the pasta pot and serve hot. Your mac and cheese looks fabulous…perfect comfort food! 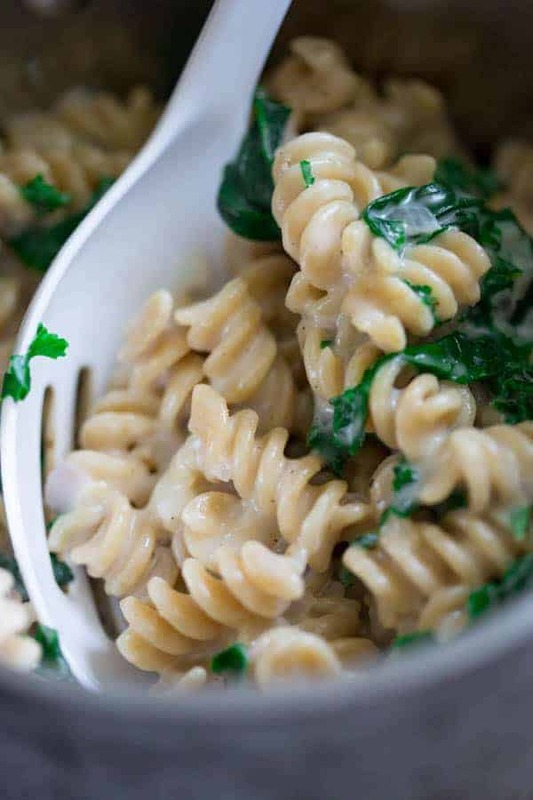 I love the addition of shallots, and I often throw kale in to our meals…haven’t done it with mac & cheese, but I will now! Try it. 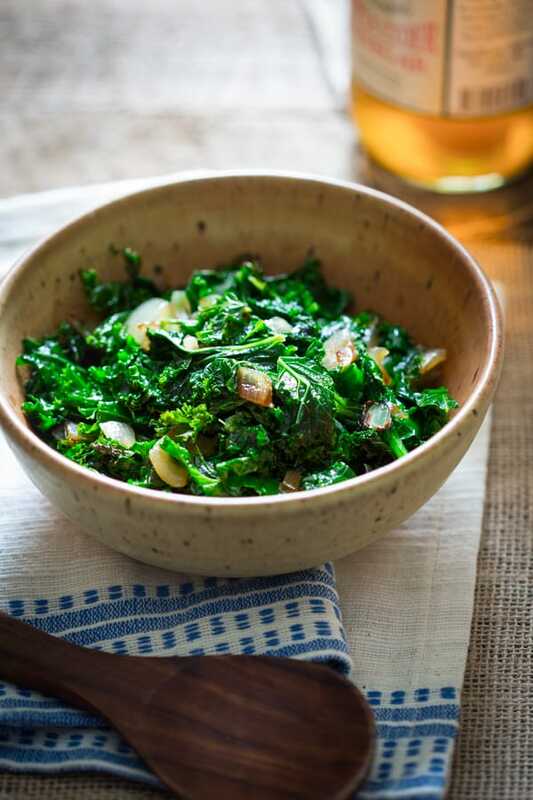 I always love it when my girls eat kale and it works so well in this recipe. I couldn’t believe how much of this my daughter ate. I thought she might pop! Okay I totally need that recipe! My older daughter loves salad and especially lemony ones. She would be so happy! Is it on your blog? It is! It should come right up in the recipe index if you type in lemony kale quinoa salad. It is really good and very easy. I make a big batch and it lasts all week, with the dressing on. The kale holds it very well. I love the addition of kale in this! i Also love that it’s made on the stovetop, it looks incredible! Yeah, it really is so easy. Thanks so much Rachel. Have a great day! This is such a good one. We loved it! Glad you like it too Allie. Have a great day! Simple is the name of the game these days! When in doubt add kale! lol 🙂 Thanks for coming by today my friend. Hi Liz, glad the book arrived. And that you like this Mac and Cheese. Email me some times we can do the interview for the podcast. I haven’t forgotten about you. I saw Amy yesterday and she mentioned the funny coincidence. What a hoot! They do, it’s amazing but true! 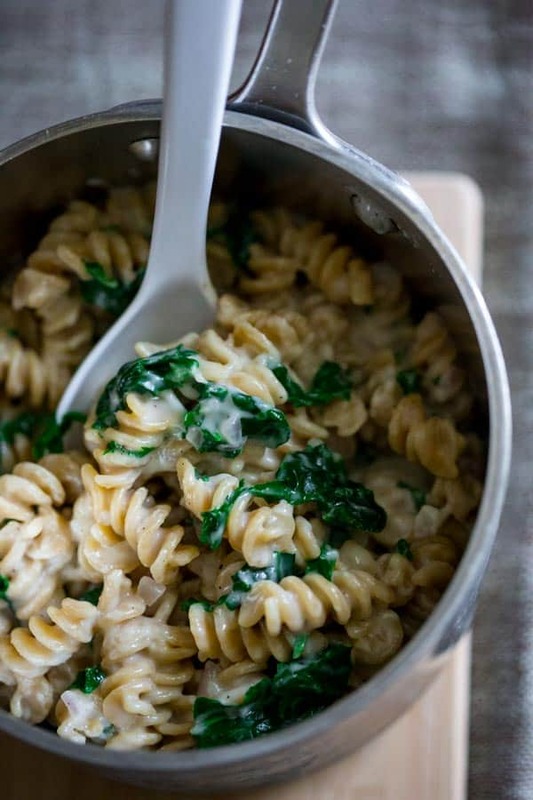 I love that you added kale to your mac and cheese! Oh and that’s it’s all in one pot on the stove. With two little ones pulling at my legs while I cook the faster [and healthier] a meal is the better! Sometimes you gotta forgo the crusty bits to just get dinner on the table. In this case though, it is an unexpectedly creamy delicious boon. Ha ha. And I remember those days of the pant leg. Now I know they are only to be replaced by other mommy-atention-getting-dramas, so in other words, keep bringing on the fast and healthy dinners. Katie how did you know that I needed more mac and cheese in my life? This recipe looks ahhhhhhmazing and totally up my alley. So glad to hear it. Thanks for visiting today my friend. 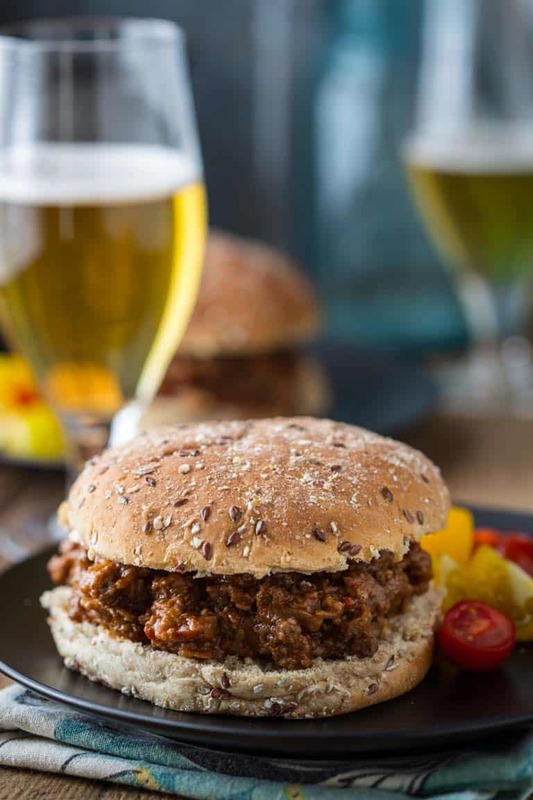 Easy peasy and tasty! I love simple and satisfying meal like this. Thanks for sharing, Katie. You are so welcome and thanks so much for the compliment. Have a great day Angie! Was it white cheddar? Because the noodles don’t have the yellow color of a sharp cheddar that one normally gets for mac & cheese. Yes, you guessed it! Where I live, white cheddar is much more common than yellow.